Star Trek: Insurrection (1998) Dir. Jonathan Frakes | Cappa Toons! 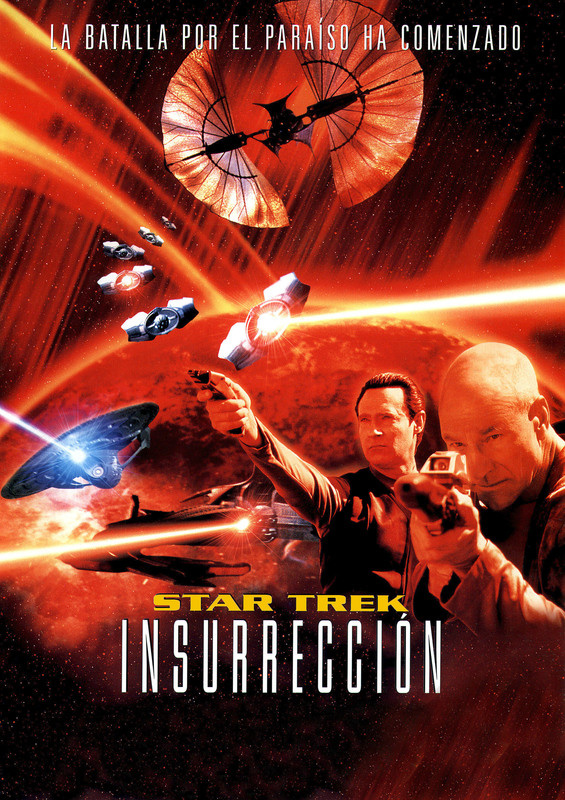 Much like The Search For Spock was to The Wrath of Khan, Star Trek: Insurrection is a tough act to follow after the marvelous First Contact. 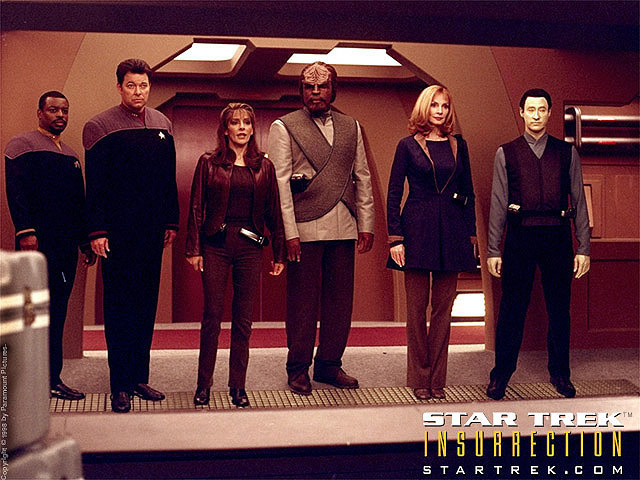 I have to say though, I like Insurrection better than Generations, and it’s probably my 2nd favorite of the TNG Trek films. But it’s not great. It plays more like an extended episode of the TV show as opposed to owning itself as a feature. Some interesting ideas play out, and thankfully the storyline of Data’s emotion chip is discontinued in this feature. But the stakes just aren’t as high as they were in First Contact. I think part of the problem is that Picard is just plain normal Picard here. He’s not facing any life altering problems. The first film he was dealing with the loss of the heir to his family after his young nephew Rene is killed in a fire. In First Contact he confronts one of the most traumatic events of his life, being assimilated by the Borg and losing his identity. After that, what’s really left? I think this film would have been better suited if they took the opportunity to focus on the problems of another character. Riker is a character that comes to mind. For so long he’s denied the captains chair, it would be nice to see a film where the cast is supporting him. It doesn’t have to be Riker though, it could be any one of the Enterprise crew. The reason it feels like a normal episode of the TV show is that none of the crew members are facing any bigger challenges to themselves. Even Data is more scaled down. The film starts off interestingly enough with him sabotaging a covert operation on an alien planet. Picard and Worf then have to work together to recalibrate his systems, but after that his character just blends in with the rest of the cast. I think my other problem with this movie is that it doesn’t feel like they really go anywhere. The main problem of the movie takes place on a standard Alpha Quadrant planet. There’s no journey to find this place and no real sense of adventure. The actual adventuring part takes place on the alien planet below where Picard has to help a race of aliens called the Baku travel safely to hide from So’na who want to conquer their planet for the use of it’s orbiting rings that give eternal youth and longevity to its inhabitants. But there’s no strange encounters or alien creatures. They’re just hiding in caves to keep the So’na from transporting them to the bad guys ships. The story plays out okay, but it’s just not that compelling as we have no deeper connection with the characters, and nobody to root for. Picard’s love interest, Anij really did nothing for me. And because this is no longer the TV series, I had no reason to invest in their romance since I knew she wouldn’t be returning after this. 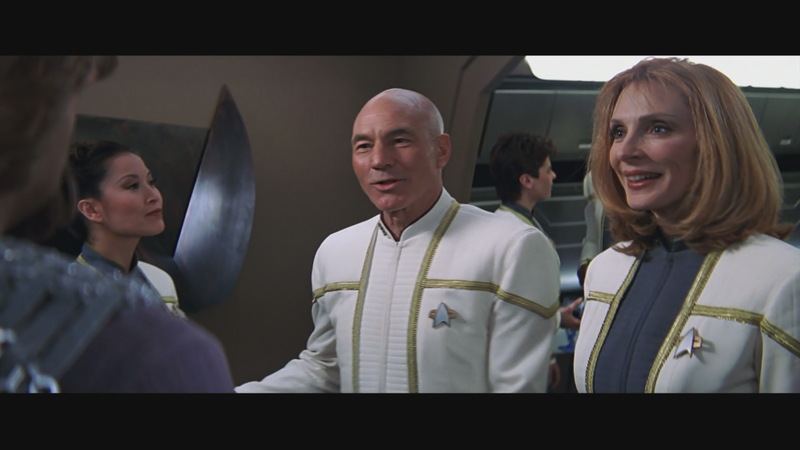 Picard talks about seeing her again, but we’re never going to see that played out again since there’s only one more Star Trek feature after this, and by then she’s out of the picture. Data’s storyline about learning to play more and be like a child is too much on the cutesy side to be engaging or entertaining. It’s also a little didactic and not very compelling in its message about seeing the world as children see it. The only story that seems to be infused with some life is the Riker/ Troi relationship, where after so long the two of them finally rekindle their romance. But not much time is really spent to engage us more in their relationship. Like I said, Star Trek: Insurrection is not a great film. But it’s decent and fairly tolerable. It lacks focus more than anything, and doesn’t give enough of a reason to make it’s main characters more compelling. It’s not bad, but it could have definitely been better.